Take a relaxing holiday in private and peaceful surroundings - there are no noisy neighbors here and the view is moreover amazing. Casa Castelot has room for 9 guests and it is therefore perfect for two families. The house has a very unique and special pool, which undoubtedly will become children's favorite facility. The property was originally a farmhouse, where agricultural workers lived and used it periodic until 1990. Then it was unoccupied for some years before it got completely renovated in 2002. This was done very carefully because they wanted to preserve the Catalan style and charm, which certainly has succeeded. One of the wonderful things about Casa Castelot is its location: The apartment is on the borderline between the two local areas Alt Empordá and Pla de l'Estany in the Costa Brava area. It is located on the edge of a hill, which gives a beautiful panoramic view over the valley below, which is dominated by cornfields, spruce plantations and oak trees. The river Fluvia winds through the Catalan countryside. 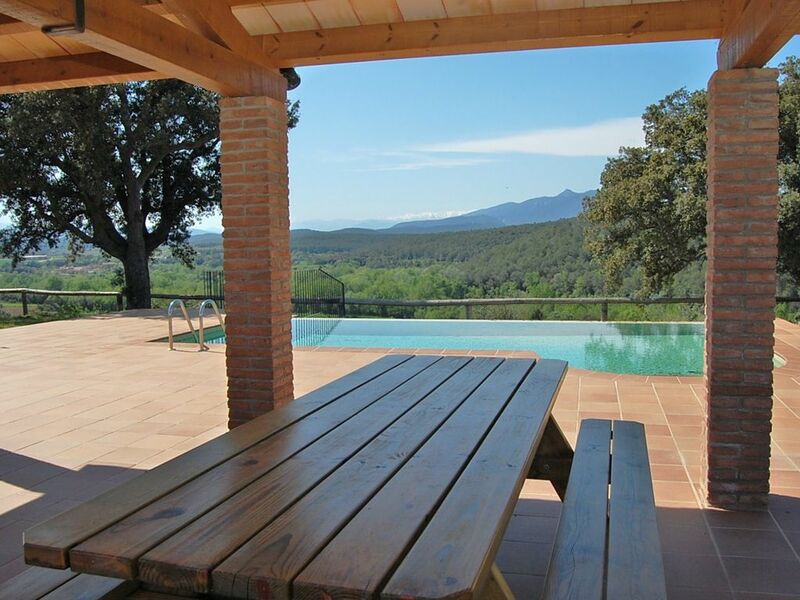 In addition to the view, the location of the property gives a peaceful atmosphere. You can enjoy the sunset over the mountains, and the Pyrenees can be glimpsed in the background. On the ground floor you will find the common areas: there is a fully equipped kitchen with microwave, oven, dishwasher and washing machine and much more, a dining room where you can enjoy your homemade meals and a cozy sitting area with TV and fireplace. There is also on this floor a large double room with a modern and spacious bathroom. From the kitchen there is a direct exit to the covered terrace - a place that probably will be your natural meeting point and it is without a doubt a perfect place to enjoy the homemade dinner. Furthermore there are a BBQ and a view to the pool, so you can keep an eye on the children playing. The staircase to the first floor is in the living room, and it leads up to two double rooms and a triple room. There is also a modern bathroom. Especially from the rooms here on this floor, you can experience a wonderful view over the valley. On the other side of the house there is also a covered terrace. The swimming pool, located toward the hillside, will surely be the children's favorite. It has a size of the entire 32 m2, and it's very unique: It has an overflow system that integrates it into the landscape. It is the ultimate relaxation place and also works as a good cooling element for the body. The pool is equipped with sun beds, where the Catalan heat can be enjoyed at full blast. The above mentioned covered patio with BBQ, chairs and dining table is right next to the pool. Lisbeth and I (Bertel) are the owners of the company SYDENS FERIEHUSE. For the last 14 years we have engaged in letting out fantastic Catalan holiday homes, all of which live up to our criterias: they are authentic, charming homes and are all of a very high standard. We now let out more than 400 beautiful holiday homes, and some of them are advertised on HomeAway - We help Mercé & Pitu let out CASA CASTELOT. The coastline north of Barcelona, the Costa Brava, is one of the busiest coastlines in northern Spain. White sand beaches, lifeguards on duty, and one restaurant after another makes it a perfect spot for an easy day on the beach. To the north the town of Roses, provides rental of windsurfers, diving equipment etc. However should you prefer something a little quieter, we highly recommend the small village of Cadaques a to the north. This beautiful village build on the rocks around a small bay, is virtually untouched by modern day mass-tourism. And although the are no sandy beaches the water is clearer and perfect for a small snorkelling-trip. Cadaques is also the birth town of Salvador Dali, and was a reuge for painters and jazz-musicians. The small and central square is a beautiful little place for a lunch. The town also has some small very good and cosy seafood restaurants. Discover the Catalan soul in a historical, carefully preserved but modernized country house. In comfortable distance from the crowded beach resorts, but still with the metropolis Barcelona, lively historical towns as Girona, Tarragona and Vic and the natural parks in The Pyrenees within short reach. We offer vacation in your particular pace, where you blend in with the open-minded and friendly Catalans. Enjoy the silence in the small hills in the pre-Pyrenees. Enjoy sports and outdoor activities as walking, canoeing or mountain biking. Or scamper about in the lively street- and café life in the Catalan towns. Here you will discover gastronomic, cultural and artistic impressions that stick. As something new we can also offer apartments i Barcelona and many more are coming. Or how about watching a football match along with 98.917 other spectators on FC Barcelona's legendary Camp Nou? The best advice is to come to Catalonia and see for yourself. The house is well-equipped with kitchen utensils and garden furniture. There are two different terraces with excellent views. If you wish to absorb the lively local life in one of the smaller villages in the Girona region, go swimming on the stunning beaches of the Costa Brava. Go hiking in the Pyrenees or see some of the most interesting museums in Catalonia. If you want everything in a week and within your reach, we highly recommend the Girona region - one of the most beautiful regions in all of northern Catalonia. The city of Girona, near the French border is a beautiful city where you get a real feeling for its history just by walking through its ancient streets. Its a walled city which dates back to the Roman period, the old quarter is located within the city walls. The coastline north of Barcelona, the Costa Brava, is one of the busiest coastlines in northern Spain. White sand beaches, lifeguards on duty, and one restaurant after another makes it a perfect spot for an easy day on the beach. To the north the town of Roses, provides rental of windsurfers, diving equipment etc. Nine is persons included. Two optional extra beds available against supplement. There are also cot(s) available on request. Price includes: National taxes and VAT, electricity, heating, water, bed-linen, towels and cleaning at departure. Not included: Catalan tourist tax: € 0,5/adult (+16) per night. PLEASE NOTE: At Catalan holidays in low- and medium season supplements may apply.